We selected this German-made surface knife as the cadillac of scrapers, because of its twin blade and comfortable wood grip. It makes scraping or applying a gesso surface onto a panel easier. This polished steel knife has a hand-shaped, varnished wood grip. The blade has a finger rest-plate for even distribution of pressure across the entire width of the blade. Slight rounding of the blade ends ensures a smooth application of materials, such as gesso, in only one operation. The flexibility of the knife blade can be accurately set by adjusting the finger rest-plate. The first-class, electrically-hardnened stainless steel blade is machine ground for maximum durability and a lifetime of wear. 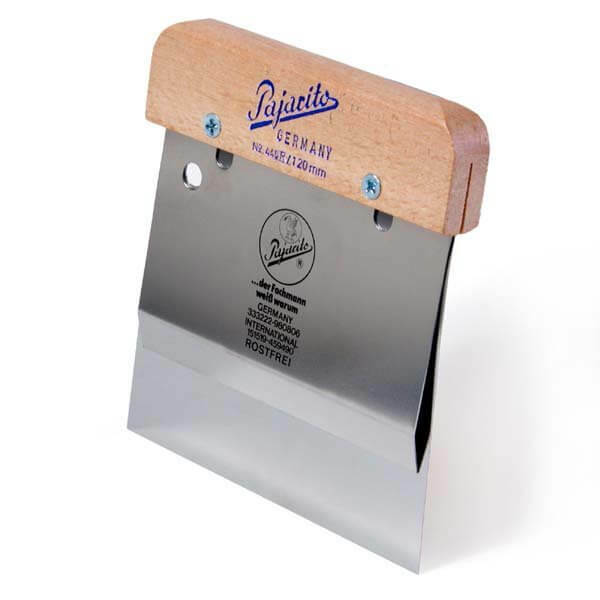 The precision-hardened blade measures 120 mm (4-3/4 in.) wide by 105 mm (4-1/8 in.) tall.